Standiford Family: Spring, where are you? That ground hog was WRONG. Not that I'm prone to believe the predictions of a furry animal that's incapable of talking but I had high hopes that Spring would be here by now. The few nice days we've had were great but they were only followed by cold, clouds, and rain. Or in the case of last night, more snow. But as you can see the sun is shining! That was a wonderful treat today. I've been in a funk all week and the sun shining in my face really helped the funk go away. Most of the snow melted but I am so ready for warmer weather. 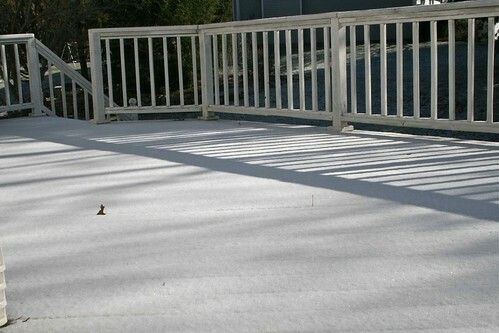 I'm noticing the deck railing is in need of a paint job. I know the deck part needs some help too. I guess I have a big project to take on this summer. Anyone want to help? It's here in AZ, of course! :) Though we did dip down into the 60's earlier in the week. . . come by anytime! I'm very tempted to come visit for Spring break. I really hope you're not complaining about the 60's. I'd take that any day. It's in the 30's here. No, we loved the 60's! But we're loving the 70's now too! Seriously, this is the best time of year to be here- it's heavenly.